After two nights in San Antonio, we spent the next day on the road crossing the barren plains of Texas on I-10, stopping only to eat lunch and fill the gas tank. There wasn’t much to see. Four hundred miles brought us to a KOA in Van Horn. Since it was already 6:30 we decided to try dinner at the Grill. The menu was limited and prepared by the work campers who were on duty. It was not the best meal we’d ever eaten, but it was adequate. Being late in the season, there weren’t many other amenities open or activities happening, but it was a clean, well-maintained park. After a walk around the park for a bit of exercise, we soon crawled into bed. To save time in the morning we returned to the Grill for what we hoped would be a quick breakfast, before striking out again. Unfortunately, a new, quite elderly couple was beginning a three-day stint and already they seemed tired and confused. I felt badly for them as I overheard the man exclaim that he had retired once before. I got the feeling that they had to do work camping just to survive. It reminded me how fortunate we are. The eggs were fried in the bacon fat, the toast was too thickly buttered and, although I had eliminated some things from my order, such as an extra egg and home fries, I was still charged the full amount. The $20 bill for breakfast seemed rather steep compared to the full hook-up camping fee. At 10:00 am we were on our way again, although we soon realized that we’d traveled through another time-zone and it was actually 9:00 am. 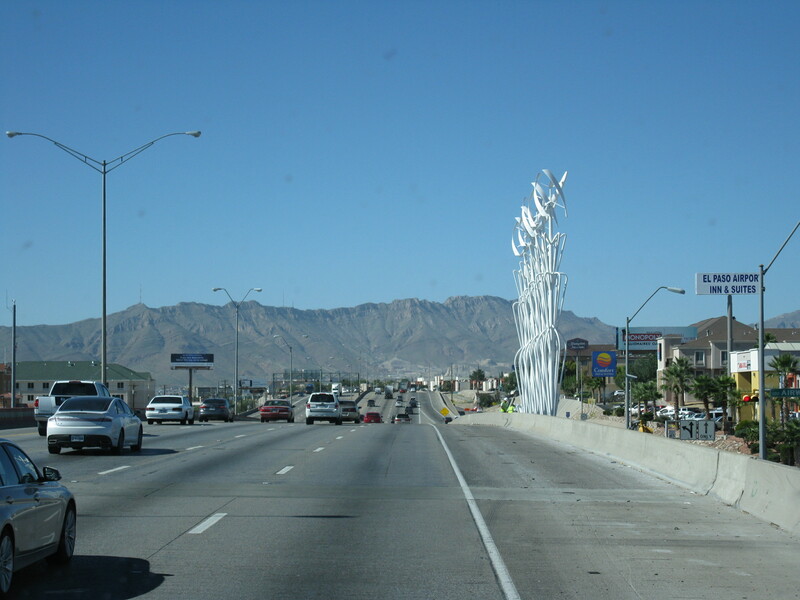 By the time we reached El Paso the busy traffic, slowed down by construction and accidents had tired us out. We’d seen signs along the highway for The Saddle Blanket and thought we’d take a wander through there for a break before lunch. When we turned off at the designated exit, however, we saw no more signs as to which direction to take. We chose the wrong one. A Google search told us that it was on the other side of the highway, so we made our way back through the congestion, under the overpass and back along the service road until we found it. We found an out-of-the-way parking spot and I gratefully pulled the door latch to get out. The door wouldn’t open. Jim tried to no avail. While he tried different things I opened the window to wave down the first person who saw us. A kind woman in a white Lincoln stopped and asked what the problem was. I explained that we couldn’t get out. We both had a little chuckle, and then she took the key that I offered and tried opening the door from the outside without success. A younger fellow in another Lincoln also stopped, but he too had no luck. By this time Jim had managed to find the only screw driver that wasn’t in the trunk, and was starting to disassemble the lock. When the woman offered me “the office phone number” saying to call if we needed more help or wanted them to call a locksmith, we realized that they were both from The Saddle Blanket. They went off to lunch and Jim got the lock torn apart. He discovered that all that jarring on Hwy 90 out of New Orleans had displaced the bolts, causing them to obstruct the opening of the door. He put it back together, fixing the problem, and we were finally able to do the tour of The Saddle Blanket’s massive two warehouses. We discovered that our “rescuers” were two of the owners, Bonnie and her son Luke. After we’d finished the tour, while we were having some lunch in the RV, Bonnie stopped by again to make sure we’d gotten out and were alright. A big thank you goes out to Bonnie and Luke for their concern. We carried on until 5:15 before stopping again at a little KOA in Lordsburg, New Mexico. It took a bit to find it, buried at the end of a street behind some dilapidated house trailers and rusted old automobiles. We were doubtful, but kept following the signs and were pleasantly surprised to find, as we rounded the last corner, that there was a line of motor homes waiting to register. We figured it couldn’t be too bad, and was probably the best RV Park around before the border to Arizona. At least there were a few trees and a small store/office, unlike the many others we’d passed along the highway. Again, it was in the off-season, so not much was happening, but it was pretty park with much to offer in-season. By mid-morning the next day we were in Arizona. 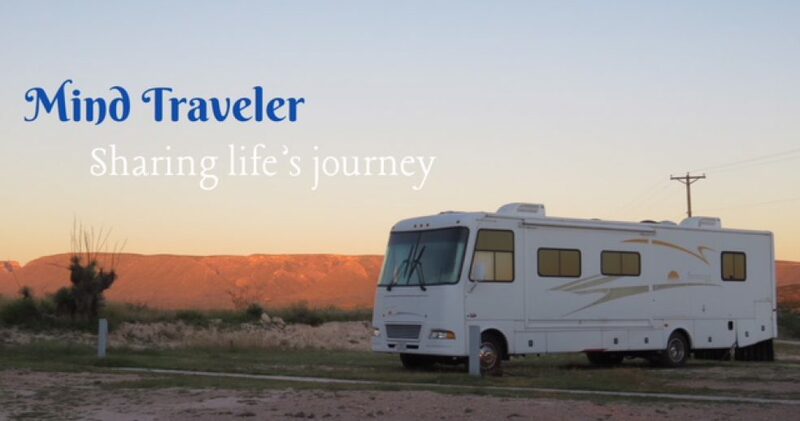 This entry was posted in RV Travel, RVing and tagged adventure, El Paso, Food, RV Travel, Texas. Bookmark the permalink. so glad you are travelling with Jim, the best handyman in the world!!! People are really friendly, out there.